As some of you may have noticed, former Two And A Half Men star Charlie Sheen joined Twitter yesterday afternoon, and today has a verified account and a million followers in a little over 24 hours. While its unclear whether @CharlieSheen is the fastest followed account in Twitter history (@KanyeWest and @ConanOBrien are also contenders), gaining such a huge audience so quickly is a formidable accomplishment. I spoke to Ad.ly founder Sean Rad this morning about Sheen’s path to Twitter celeb-dom and he told me that the story came about simply, as the result of a phone call. According to Rad, Sheen’s management, specifically Sheen’s digital manager Robert Marin, called Ad.ly early yesterday morning about getting Sheen on Twitter, because Ad.ly is known as the “go-to place” for social media in the Hollywood community. Rad then called Omid Ashtari, Twitter business development and Hollywood liaison, who then took the @CharlieSheen account back from a squatter. 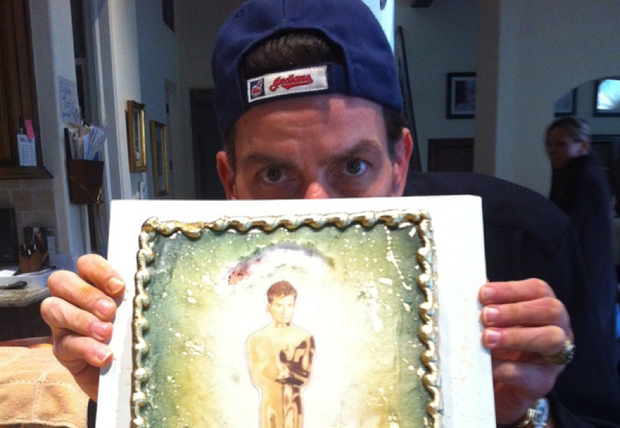 By 1pm the account was up, and Charlie Sheen tweeted out this image shortly after our post went up. His made up hashtag #tigerblood was trending shortly there-afterwards. “His goal was to get on Twitter so he could reach out to his audience as fast as possible,”Rad said. Rad is unbelievably transparant about the whole process which involved giving advice on how to tweet, @reply and what a hashtag is. It seems like Sheen caught on pretty fast. And while Sheen is in the Ad.ly network, which means that Ad.ly is mining his follower data to present to advertisers for tweets, he as of yet has not become a publisher, (“we have no plans right now”) which means sending out a lucrative tweet endorsement. 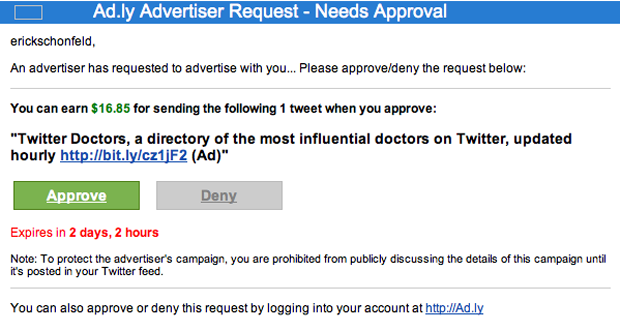 Ad.ly tweet endorsements run anywhere from $1000-$20,000 depending on the celebrity Rad told me. For the less famous members of the Ad.ly network, like our own Erick Schonfeld, those numbers are less underwhelming. For the past day, Sheen has been tweeting out images of brands, in a sense giving free advertising to Pepsi’s Naked Juice and Direct TV.